Joseph Meek Jr. said he was drinking vodka with 21-year-old Dylann Roof when Roof made the remark while he was railing against blacks. Roof didn’t elaborate on the plan, but Meek said he was worried. He said he knew his friend had a “Glock” — a .45 caliber pistol — in the trunk of his car. Meek said Roof told him he bought the gun with money he got from his parents for his birthday. With the way Roof was carrying on, Meek said he took the gun from the trunk of Roof’s car and hid it in his house, just in case. But Jacob said he thought Roof was referring to periodicals – instead of a device that stores ammunition. Meanwhile, a North Carolina florist is being hailed for her help catching the man accused of shooting and killing nine people inside a black church in Charleston. Debbie Dills had been on her way to work Thursday morning when she saw a familiar black Hyundai next to her at a stoplight. She says her heart raced when she saw the driver: A white man with a bowlcut, just like the photos of the suspect she had seen on the news. 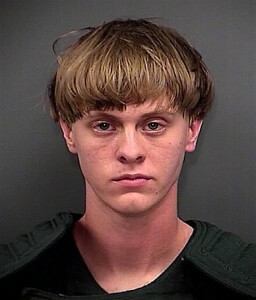 The apprehension of 21-year-old Dylann Roof ended an intense, hourslong manhunt. Dills says she called her boss, Todd Frady, who called a police officer he knew. That officer contacted the Shelby Police Department, whose officers captured Roof. Dills says she caught up with the suspect and got a license plate number, following the car for about 2 miles while police confirmed it was the right car.